Some people are kind of costume wallflowers. They prefer subtly when they dress up—costumes that hint, suggest, or tease—while others...well, it's all-out, all the time! Feathers? Yes, please! Sequins? The more the merrier! Glitter? Don't even get us started! 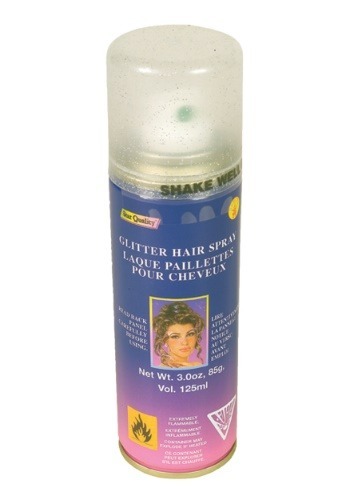 This Silver Glitter Hair Spray is for the costume mavens of the world, like you! Totally fun and completely temporary, this high-shine spray helps you give into your every costume whim, without a lot of muss or fuss! This little bottle defines you as the best kind of costume lover—the kind who will try anything for the right look! This convenient can provides you with hours of endless, high-voltage fun. After reading the instructions, spray it onto your locks for a silvery sheen that will perfect your look. Whether you want to add drama to a witch costume or you're dressing as a funky rock star, this product promises to pack a big punch! We love the way your fierce spirit makes its way into your costume looks! We hope you'll keep being your best and brightest self, and that this glittery spray can help you feel that way, any day you use it!